In historic or new period homes, care must be taken to locate mechanical registers and lighting to minimize their visual impact on the carefully designed spaces. The two small “mail slots” above the opening to the butler pantry are high velocity air supply registers. 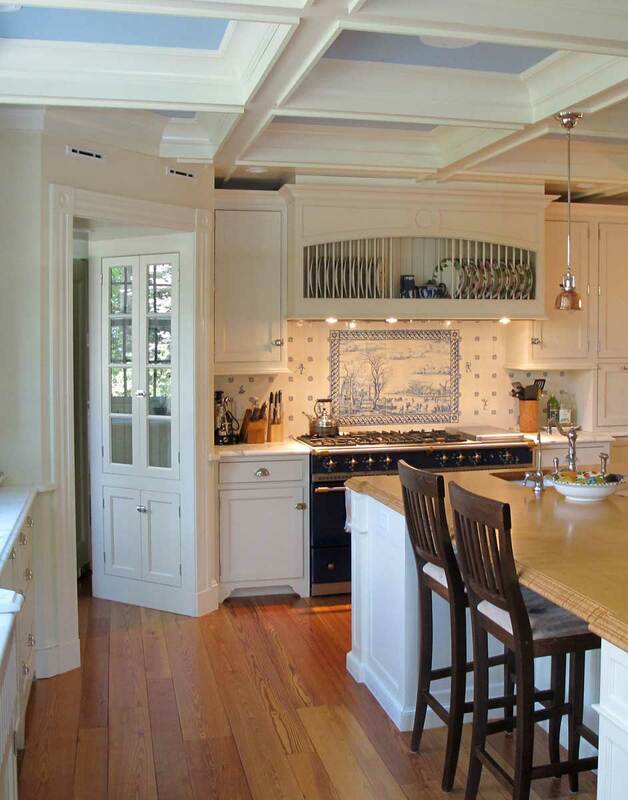 The ceiling lighting was carefully located to coordinate with the coffered ceiling in this kitchen. We do not use outhouses anymore—thankfully modern plumbing has enabled us to evolve from that earlier time. Kitchens used to be purely functional workspaces for the staff, in the back room, and not used or frequented by the family. Fireplaces were once the only source of heat, and cold air leaked inside the house during our cold New England winters, meaning bundling up when sleeping. Ceilings were built low to preserve whatever heat could be generated during the colonial period and beyond. And the earliest homes built in America, up until about 1830, were built like barns, with post-and-beam construction, limiting the sizes and shapes of the houses and the rooms within. Here in the early 21st century, we have infinitely more choices on how we can design and plan our houses to accommodate our contemporary lifestyles. We can still design and live in homes that respect the historic styles that have stood the test of time. The trick is to carefully blend the two seemingly opposing concepts together to create what is today called the “new-old” house, a house that is designed in a particular historic style with all its period charms, but also has all the modern conveniences and the open spaces families today both desire and demand. Julie Williams Design of San Francisco designed this small family room with built-in bookcases, storage and a television monitor above a fireplace. This is one of many solutions were can be used to integrate modern technology with more traditional uses such as fireplaces and traditionally-design cabinetry. Today, most families consider the kitchen as the heart of the home, where family members and friends automatically congregate to cook, eat, and socialize. A direct and open connection to the adjacent family room is part of this new centralization of the family’s social activities. In historic homes, rooms were general compartmentalized into separate spaces, largely for practical reasons, to serve multiple functions, and when heat was a scarce commodity, individual rooms could be closed off to conserve valuable heat. Since neither of these issues is a concern to the contemporary home owner, family-oriented zones in today’s home have evolved into a more open sharing of spaces, hence the direct kitchen-family room connection. The conventional living room and dining room have all but disappeared in contemporary house design. When designing a period style house, the architect can carefully plan for this change to a more open plan by clearly but subtly separating adjacent rooms with large cased openings or low walls (some with bookcases) with columns that are meant only to “frame” the rooms, without totally enclosing them. The rooms can feel both enclosed and connecting at the same time. The market place has a wide selection bathroom finishes, fixtures and fittings designed in various traditional styles, so modern bathrooms can be easily designed with period elements and still function as contemporary bathrooms. The kitchen, now the center of most homes, can utilize cabinetry styles that reflect the original style’s butler pantry millwork, so the period details of the kitchen millwork can be appropriate to the style of the house. Appliances such as ranges, ovens, dishwashers, and refrigerators can either adopt the neutral stainless steel finish, or be hidden behind paneled doors and drawers for a more historic look. 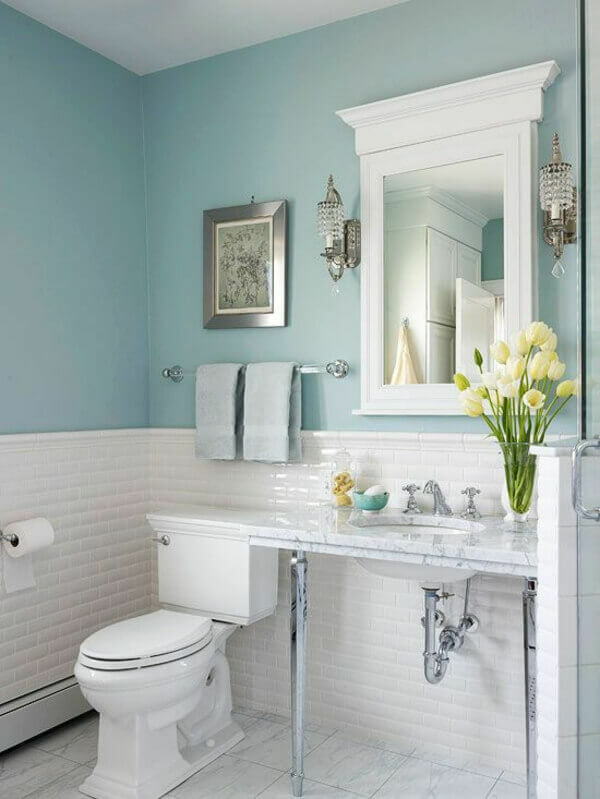 There are a wide variety of plumbing fixtures and fittings available today that can be select to obtain a period look. Contrary to popular belief, granite, so popular in kitchens today, was never a countertop choice in historic homes, which usually had soapstone, wood, marble, and other similar materials being used. Selecting materials such as these will help make the kitchen appear more period authentic. Lighting fixtures as well can be selected to blend in with the various period styles; there are numerous period lighting suppliers to select from. Recessed “can” lights can be used when/where appropriate, but care must be taken not to overwhelm the spaces with this contemporary looking fixture; recessed lighting should be used as a last resort, when the more traditional pendants, surface mounted fixtures, and sconces will not adequately get the job done. When incorporating heating, ventilation and air conditioning (HVAC) to a historic home or a new-old house, extra care must be taken to integrate the air supply and returns to reflect earlier (and more crude) central heating and air conditioning systems of the earlier 19th century. Often supply grills and returns can be hidden in stair risers, or above bookshelves, or in places not seen. If floor-mounted, registers can be period metal grills, such as those from Reggio. Decorative plaster grill returns can be used in walls, as a decorative element, rather than appear as a necessary evil to disrupt the clean walls surfaces. Radiant heat and high-velocity air systems are often used to minimize any visual evidence of a modern mechanical system. For me, I especially enjoy the special challenge of designing traditional projects for my clients that may look like they were built a hundred or more years ago, but still have all the modern conveniences we want and take for granted today.